They prefer their horse over their kids. 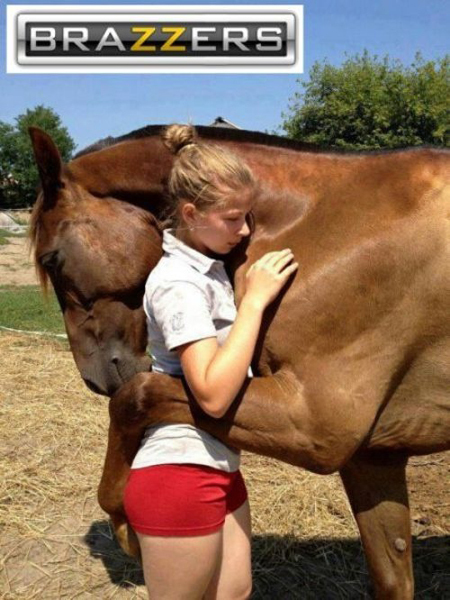 They prefer their horses over any potential spouse. And they prefer their horse over their friends. And thus was the case of my Wyoming friend. She valued her horses more than anything else, including herself. She fell in love with them. Talked to them as if they were humans. She put them at the center of her life. And thusly, was left alone on her ranch with them. I decided to expand more on the subject but I did not want to twist the message so mush, rather be a add on the the original essay. The commentator Carson D hits the nail but suddenly there is a debate about his point. You can go and read the whole comments section but here I'm going to explain a bit just using a few. .......was the unedifying sight of two young Dutch women getting visibly sexually excited whilst watching the massive ape strut about its enclosure. Many people find hard to believe that such thing happen and that women are more prone to it than men....literally, this is because we tend to see women as pure being whose sexuality is always "right". Women's sexuality is more fluid,it will take her with whatever gave her tingle even if that thing is another wild animal. Throughout mainstream media you can see how women's perception never chance not matter their age, fairy tales are still today with disguise as modern cool pop culture, something that people never asked during a fairy tale was this: what if the beautiful maiden wants be to with the beast? 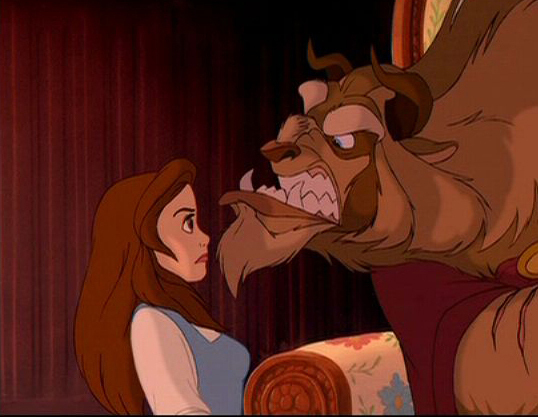 what if the only reason why she chooses the knight is because the beast is death? the first question is played very well in "Beauty AndThe Beast",Belle chooses to stay with the beast, Gaston goes and try to kill the beast even thought she did not want to be with him from the beginning, many fairy tales also show the beast (dragon,ogre or whatever big thing you can imagine) displaying real sexual interest on the maiden of the day. The horse is the animal that can make a women go crazy in many ways that not other animals can, this is because the horse is the closest animal that human have that represent the ultimate alpha characteristic, physical strength, horses have muscles not human can compete, height, in not other way an animal represent height like a horse, elephants look more like fat giants and giraffes are boring. It's much simpler- horses are curious animals able to return emotions and feelings,thus emotionally vulnerable chicks get attached to them. Here is when the hamster spins fast, as the animal can't talk the woman must interpret what the horse feels and then apply it her feelings, have you ever seen a girl with a horse where the girl gets mad at the horse? that never happens, she will always feel guilty for whatever happen to the horse, every time the horse misbehave it is excused by her and how it didn't make it on purpose, the horse can even make her fall and brake her several bones and she will excuse it, similar to cute girls who excuse bad boys who beat them. Then there is the " fix him" "save him", like girls feel the "duty" to save bad boys who go against the law she must save the wild beast, she must tame it, in her mind "if she doesn't tame it no one else will". This is the combination of alpha: ultimate body not matter is not human and beta: sensitive and caring but without saying a single word,all mixed in the horse. Jesus christ, proof-read your posts. This is almost unreadable. 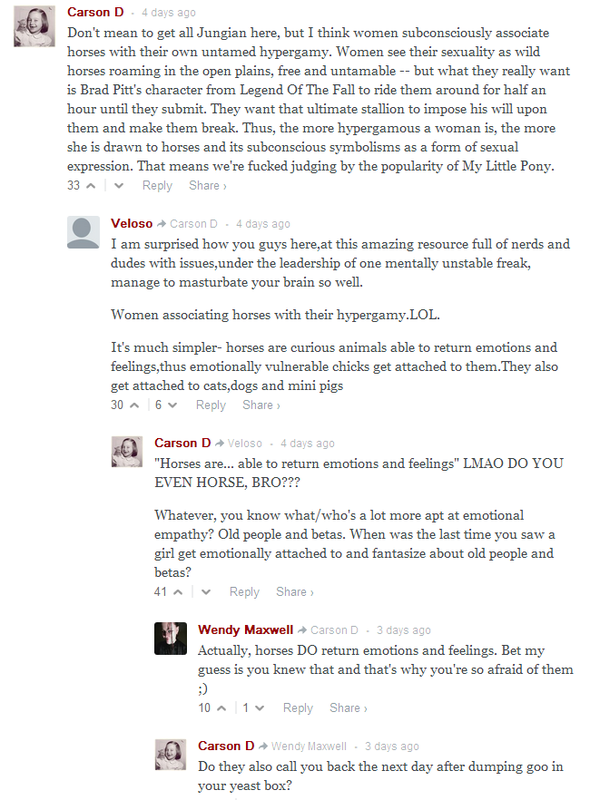 Are you jealous that horses are more into women than you? There was a study done at Columbia University a few years ago that showed that women were more sexually aroused watching chimps mating than watching male bodies. The study also showed that men were not aroused by animals in the same way. And they also pick males who are barely above the level of outright savages in order to feel superior to them. "I'm the ONLY ONE that understand him and know who he truly is."